Researchers at Emory University and Morehouse School of Medicine are building an ambitious project to work with teen-aged and young adult minority communities in metro Atlanta to co-create an mHealth (mobile health) platform supported by mobile devices. 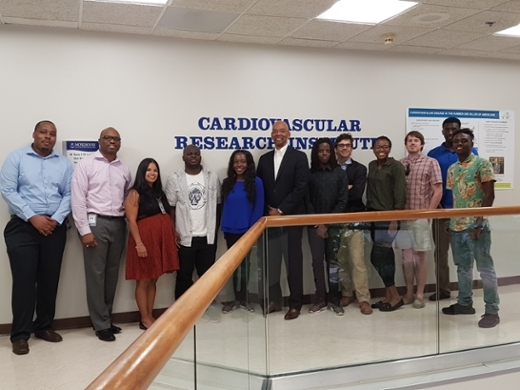 The Emory-Morehouse School of Medicine project recently was awarded a $1 million grant from the National Science Foundation through its ‘Big Data Hub Spoke Awards'. As part of the Big Data network, the team will collaborate with universities across the Southeast and leverage cloud-based services from Amazon Web Services, and consulting assistance from Relus Cloud, in order to expand the program to include electronic medical record data, health care system resource utilization and external data from weather, pollution and diet. The team is led by Gari Clifford, PhD, interim chair of the Department of Biomedical Informatics in Emory University School of Medicine and associate professor of biomedical engineering in the Coulter Department of Biomedical Engineering at Georgia Tech and Emory, and Herman Taylor, MD, MPH, Director of the Cardiovascular Research Institute at Morehouse School of Medicine. The mHealth platform allows the monitoring of enormous amounts of data from wearable devices recording physical activity, social network behavior, and physiology down to a resolution of seconds and a few meters. Signal processing and machine learning will be used to build predictive models for cardiovascular health and mental health issues. Processing will be done using secure and cost effective cloud-based services. "Our team will create a detailed and comprehensive picture of a patient’s health, along with a tool to help patients view and track their own data over time and manage their engagement with their health care providers. In doing so, we can build individualized predictive models that harness the data flowing from our everyday activities," says Clifford. To simultaneously address challenges of community trust and disenfranchisement, the team is training members of the participating communities in software programming, privacy and health literacy for empowerment and the generation of opportunities in the health IT economy. The team is collaborating with TechSquare Labs (an Atlanta incubator for entrepreneurs) and President Obama’s TechHire program, an initiative to expand local tech sectors by building tech talent pipelines in communities across the country. "There is a tremendous opportunity to improve community health and advance health equity through the use of mHealth approaches. However, these approaches must be unequivocally trustworthy, sensitive and responsive to community and individual concerns. This is why we have placed deep involvement of individuals from the affected communities at the center of our initiative," says Taylor.